Right next to our front door there’s an ever present collection of sticks. Our 5-year-old son Pim is like a dog, seriously! Every time we go to the park, he will find a stick and insists on taking it home. Some of them are too big for him to carry alone, so he has to convince his big sister to help him. Because I don’t allow them in our house, the sticks are displayed right next to the front door — which is the closest the sticks will get to his bed, because he would take them up there if he could, I am sure about it. My husband once threw away all the sticks, which was a mistake — Pim was inconsolable and I admit that even I was upset. Those sticks seriously meant so much to him! And so they stay, the sticks, next to our front door. And the collection grows. 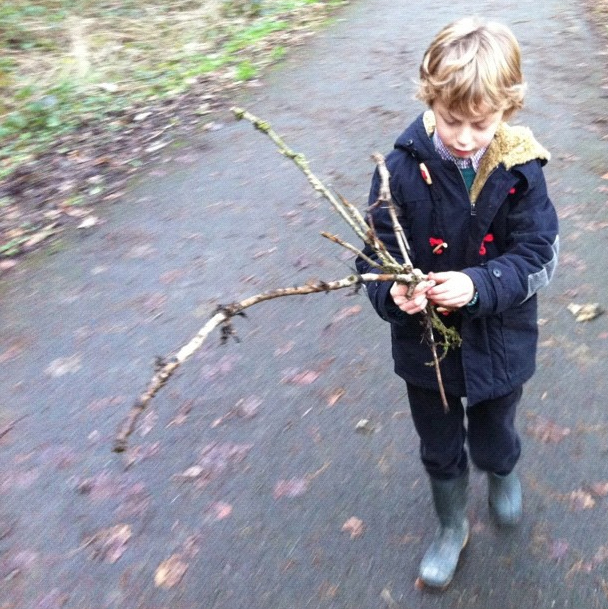 Do you have a son (or daughter) who collects sticks too? I love this! I have a five year old boy also with a stick obsession and we have a stick pile by the front door for the same reason(as well as various collections in the car, around the garden, the bottom of the buggy..you get the picture..) so glad its not just us!! thank you for posting! Yes! I thought we were the only ones with what’s starting to resemble a beaver dam next to our front door. In fact, this afternoon my son suddenly stopped in the middle of the street because he spotted a “perfect” stick to add to the collection. His little sister copies him, so we are worried if we’ll even be able to open our front door anymore. However, we don’t have the heart to throw them away. Oh yes, the stick obsession! My eldest is 5 and had a serious collection. Each one has a memory attached, where it was found, what he was doing at the time. I don’t know how I’ll bring myself to dispose of them, but we have enough for a small bonfire now! My 4.5 year old daughter has a serious rock obsession. We limit her to picking just one every place we go, otherwise we would be overrun! I get the fascination with the pretty ones, but the gravel stones??? I must say, keeping a collection by the front door is inspired. I am thinking perhaps a bin or bucket by our garage door just might do the trick. I hear you! Coco used to pick up handful of gravel from all the parks in Paris. When she wanted to give me a present, she would present me with a few gravel pieces, as if they were diamonds! Oh yes, sticks wherever we go is my two boys’ mantra!! Thank you for writing this Esther. My daughter collects all sorts on a walk – sticks, stones and the latest was a kruis sleutel saying it was the pirates x marks the cross! Now that I’ve read Hannah Evans article I shall have so much more sympathy for her collections and may just hold on to them a little longer – to save the tears!! My 7-year old boy is very much into the stick/stone/shell/leaves thing. We have a good collection and it would not be a surprise that I open my bag in the office and find many of these. Thank you! No, not yet! I’ll order it now — thank you! Oh my gosh Marie, that is BRILLIANT!! Pim would LOVE that!!! Can you send me your adress by pm? Yes, children love sticks. My five-year-old daughter has always been fond of collecting sticks. Whenever we go on walks, we come home with more than a few. The boot of our car, our bike trailer and various backpacks are always full of sticks of various sizes and shapes. I have to admit, I’m a bit obsessed with sticks! Well, driftwood really. Any chance I get when I am back in Ireland, I collect so much of it and stuff my suitcase with it. The husband just rolls his eyes and thinks I’m a bit weird! Love this. I’ve been thinking of doing something like that for ages! Hi Esther, there is a book we all love called “Stanley’s Stick” by Neal Layton and John Hegley. It is such a beautiful book on the subject ! Thanks for posting this….Harry (almost 4) loves sticks and we also don’t allow sticks in the house so the pile beside the front door grows (I sneak some for kindling occasionally), the boot of my car has a collection of them too. We have just returned from 2 months in Australia where Harry was disciplined by other children to put sticks down….. the rule there is no sticks in the playground and Harry found the rule so harsh that he wanted to go on our ‘next big walk’ with a family that did not have kids so that he could play with sticks again. Right now I’m delighted that playing with a stick wins over a commercial toy…. but the flashing lights and screens are beckoning. My granddaughter who is 2 and a half, collects stones, leaves and also sticks, my daughter- in-law is going to stop her from doing this. Hi Sarndra, maybe you can convince your daughter-in-law to let her keep collecting her treasures?